At the end of her monologue Wednesday night, Fox News host Laura Ingraham issued a dire warning to the country: "This is a national emergency, and we must demand that Congress act now." The national emergency wasn't weather-related. It wasn't a shortage of medicine or food. It wasn't a cyberattack or terrorist threat. It was, instead, "massive demographic changes." What once might have been a dog whistle is officially a scream, voiced over the airwaves of the President's favorite cable news network. It's a sad commentary on Trump's America. "In some parts of the country, it does seem like the America that we know and love doesn't exist anymore," she complained. [post_ads]"Massive demographic changes have been foisted upon the American people, and they are changes that none of us ever voted for, and most of us don't like. From Virginia to California, we see stark examples of how radically, in some ways, the country has changed." In case it was unclear, she explicitly said it: "Now, much of this is related to both illegal, and in some cases legal immigration that, of course, progressives love." To many, that sounded racist. That's because it is. She isn't complaining that the country's getting older or younger, richer or poorer, that we're having more or fewer children or moving to the suburbs. She's complaining that people who come to America from other countries -- even legally -- are making this country unrecognizable to her. Indeed, to "us." Who "us" means is also clear: Fox News viewers, who are predominantly 65 and older and white. I know many of those viewers, and I'm sad to say that message probably resonated with a lot of them. The outrage on blue-check Twitter over Ingraham's comments was widespread. I weighed in myself, telling Ingraham to speak for herself. But blue-check Twitter is not representative of the America she is speaking to. If you're surprised by what she said, or that Trump's America seems just fine with this, you haven't been paying attention. This is why he won. 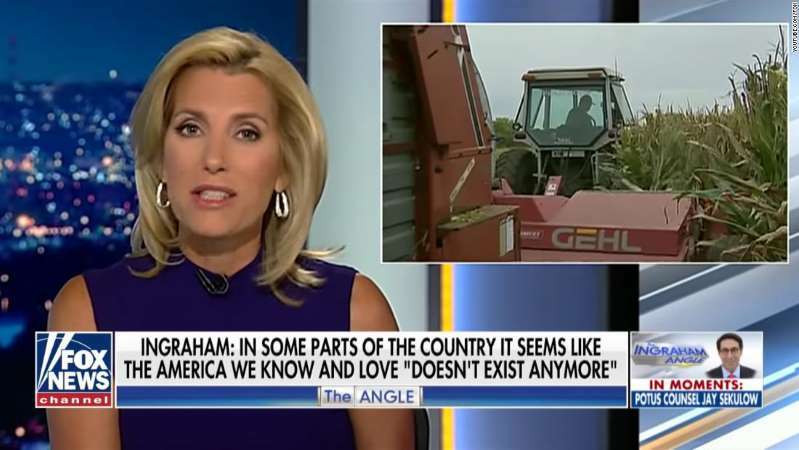 Because there are untold numbers of people across the country -- from Virginia to California, as Ingraham put it -- who believe their problems are the fault of people who don't look like them. Whether they're right or wrong is beside the point. It's a fear and loathing that many in politics -- from both parties at one time or another -- have happily fomented and stoked to win votes. It's deep and it's real. Now, the President of the United States is just the latest prophet of this religion, and unsurprisingly, he has plenty of devout followers.